Our species stands at another crossroads in its own survival, and so the themes explored by the Rewire Festival seem more relevant than ever. Now in its eighth year in The Hague, Netherlands, this most contemporary of experimental music festivals took place over 12 venues in the Netherlands’ third city, with a wide-ranging programme of music, performance, workshops and talks. It provided plenty of food for thought about human and post-human notions concerning our relationships with machines, with each other in a time of civil meltdown, and with what we can do to address our problems as artists and as people. 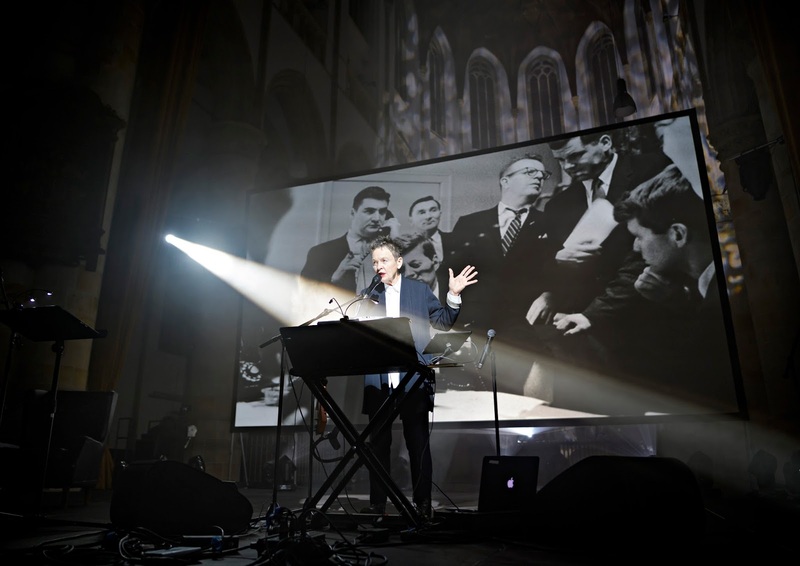 The 2018 Rewire Festival succeeded in both entertainment and analysis. Primarily obeying an electronic art focus, with 1-bit works and machine drawings from Tristan Perich, and Kyle Dixon and Michael Stein's acclaimed performance of the soundtrack to Stranger Things in the mist-soaked power-station venue Electricitieits-Fabriek, Rewire situates between the viscerally human and the systematically electronic. Electronics have been getting steadily better integrated into what we call jazz all the time, and at Rewire there was plenty to fascinate on the jazz front, with a strong programme of artists coming from the left field of the music, from the fearsome physical impact of The Thing and Irreversible Entanglements to intriguing newer voices combining electronic and acoustic approaches including Ben Vince and Laura Agnusdei. Irreversible Entanglements brought an anger unmatched at Rewire except perhaps by American multi-disciplinary artist Juliana Huxtable’s 50-minute work Triptych, a spoken word exploration of gender and sexuality, opening with the bitter refrain “what scam today/ what trap?”. Live drums echoed explosively in the Grote Kerk Den Haag under its skying High Gothic windows. Seeing a sexually-charged LGBTI+ themed work in a church was an ironic reminder that there are plenty of people who claim to be religious who would like to kill us. 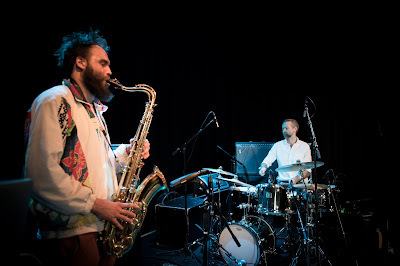 Styling themselves for the Dutch audience as comedic invading Viking marauders, The Thing is a longstanding trio of Scandinavian heavyweights Mats Gustafsson (saxophone), Ingebrigt Håker Flaten (bass) and Paal Nilssen-Love (drums), who are like a free jazz Black Sabbath, but heavier. Their semi-free pieces/compositions/starting points were named from Viking themes but included, almost lovingly, a 1984 neo-soul tune by Frank Lowe, Decision In Paradise. Fierce and momentous, irreverent and empowering, they were done in 40 minutes, which, even with the short turnover of festivals, seemed as abrupt and wanting-for-more as ever. James Holden & The Animal Spirits were perfect for the midnight slot on the Saturday night. DJ-turned-bandleader James Holden had spoken enlighteningly earlier in the day in an RA Podcast recording about his fusion of electronic music genres of trance and techno with Malian textures and rhythms, at one point illustrating a rhythm of a triple beat over a double beat. The rhythmic ideas he talked about are evident in the music, which is a great mix of electronics, drums and driving brass. Hypnotic but with a responsive personal dynamic between the players, the music has a basis in UK club dance music but, reappraised as an entirely live performance, it is a unique hybrid of styles and influences that Holden makes his own. 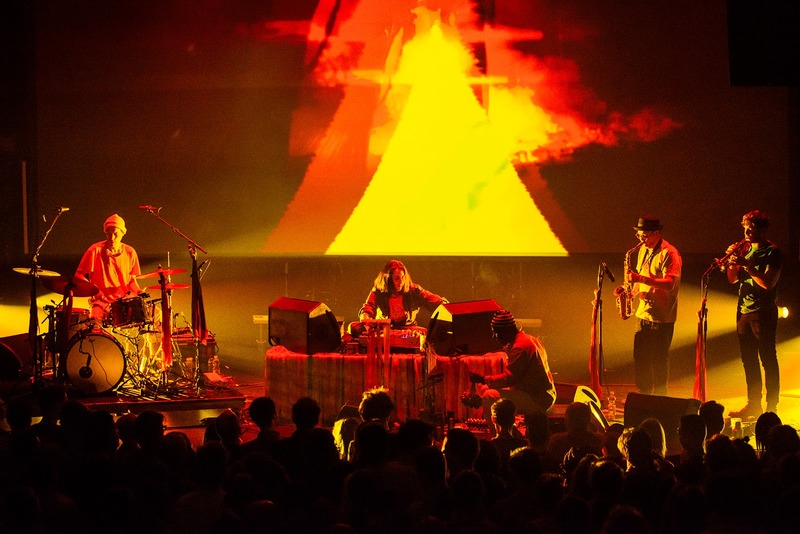 Sitting cross-legged among psychedelic visuals, flanked by speaker blocks, a drummer and a brass section, he lets the group realise his vision in its own way. Drummer Tom Page reminded me a lot of Moses Boyd – the same easy grace with the classic jazz chops, but integrated into a driving force beyond just jazz. The music contains rhythmic slippages and variations, some subtle, some momentous, that keep it interesting and fuel the sense of trance state. This is important: Holden wants you to come out of it altered, employing trancey repetitions with constant variation and rhythms cutting against each other. It has everything I love from jazz and contemporary classical and electronic music and it made me feel euphoric. I’d have loved to see New York no-wave pioneer Arto Lindsay performing his signature blast of noise and groove with Zs, but it clashed with Daniel O’Sullivan’s six-piece Lion Ensemble including free scene stalwart Alex Ward on clarinet and electronic artist Astrud Steehouder aka Paper Dollhouse. Their set was a relatively conventional collection of emotive songs that took the pressure off the piling up of the jazz-related gigs on the Saturday night. Another timing clash meant I missed Joshua Abrams Natural Information Society, but fortunately I’d seen them in Amsterdam two days before at the Bimhuis. The group includes Abrams on double bass and a guimbri (a 3-string Moroccan Lute), with harmonium, gong, percussion and bass clarinet. It got hugely Terry Riley in its hypnotic variations, offering another approach to the same mental state that James Holden is pursuing. Weirdly, I’d noticed they were doing a three beats over two beats double-rhythm at the time, before James Holden mentioned it, and now I wonder if I’ll just hear it everywhere. I hope so; it’s awesome, possibly profound. In the Koorenhuis foyer I enjoyed drummer and composer Laurence Pike’s personal take on jazz and electronic experimentation, and saw London-based saxophonist Ben Vince twice, relishing his creativity in employing loops to create sonic landscapes that shift in and out of phase with surprising beauty, and his duo with drummer Rupert Clervaux in which his complex saxophone atmospheres were locked down into sympathetically hard grooves. Laura Agnusdei layers up subtle electronic textures that she then responds to and expands on with a wholesome tenor sax tone (sometimes layered up as well) and touch-synth circuit breakers to generate clicking sounds as a disruptive element. These foyer gigs are like experimental labs for future directions in the music. I can recommend Ivan Vukosavljevic & Il Hoon Son’s minimalist resonating music using an electric guitar inside a piano, and Tom Rogerson’s largely improvised pieces for piano and synths. Playing from his album with Brian Eno, Finding Shore, he talked about his imminent fatherhood and how his performance at Rewire was the “last gig before…” that signal life event, and how when you’re about to become a parent, everything becomes the “last thing” before that happens. For him, this had led him to embrace a more direct, personal and honest approach to music. His set had a loving beauty that embodied these profound quiddities with great charm. We wish him the very best!